Dubbed unofficially the Streamline Gunbus, the F.B.9, which emerged towards the end of 1915, introduced numerous refinements over its predecessor, the F.B.5. The fuselage nacelle was of improved aerodynamic form; the wings and tailplane sported rounded tips; streamlined Rafwires replaced stranded steel cables and turnbuckles for interplane bracing, and a plain, Vee-type undercarriage supplanted the twin skids previously used. The standard power plant remained the 100hp Gnome Monosoupape rotary. Vickers built a total of 95 F.B.9s, and a further 20-30 were built by Darracq in France, some of which were issued to the RFC (No 11 Sqn) and were used during the Battle of the Somme which began on 1 July 1916. The manufacture of the F.B.9 in Italy by Vickers-Terni fell through owing to political reasons. A version designated F.B.10 powered by an Isotta-Fraschini engine was proposed but not built. Outclassed by more advanced fighting aeroplanes, the F.B.9s saw only brief first-line service, the great majority being assigned tuitional tasks on delivery to the RFC, for which some were retrofitted with dual controls. For gunnery training, some F.B.9s were fitted with a Scarff ring on the front cockpit, but none remained on charge at the time of the Armistice. The aircraft in the upper photo is in fact an FB5 and is the same image that can be found on the FB5 page. Tell me Aviastar who does your picture editing? trainers and as gunnery trainers. Were these V FB9 in use by 41 Sqdn RFC in September 1916 ? Many thanks for any help. 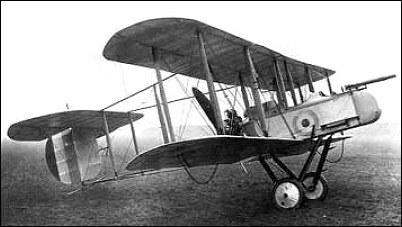 F.B.9s were fitted with a Scarff ring on the front cockpit, but none remained on charge at the time of the Armistice.